Featured artists: Jason Avery, Lexie Bouwsma, Elaine Coombs, Robin Denevan, Sara Dykstra, Kim Frohsin, Paul Gibson, Christine Aria Hostetler & Joel Daniel Phillips, Kay Kang, Bruce Katz, Joshua Young Lee, Katja Leibenath, Saundra McPherson, Erika Meriaux, Annamarie Pabst, Silvia Poloto, Gail Ragains, Rachel Sager, Kirsten Tradowsky, Beth Waldman, Ealish Wilson, John Wood, Sandy Yagi, Aoi Yamaguchi. 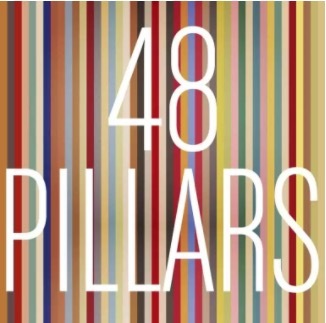 48 Pillars: 24 local Bay Area artists will produce two pieces each on identically sized panels that will exactly ring the gallery – 48 works total. This is the second exhibition at Arc Gallery that is essentially a “structural constraint” show. The other exhibition is our iconic annual, end of summer exhibition, FourSquared. In both exhibitions, the artists are unconstrained in subject matter except to the extent that works need to be a series; but they are constrained in format. It should be visually stunning.